There is a paucity of studies among the most disadvantaged group, i.e., construction migrants that examine the entire ambit of social determinants affecting health and well-being. To understand this, the present study was conducted with an objective to assess the impact of social determinants on well-being (general, physical, mental health, and activity limitation). The sample size of 136 construction workers was estimated using 4pq/l 2 formula; prevalence of sickness absenteeism as 10% (according to Annual Labour Report 2013) and 5% precision was taken. The study was conducted over a period of three months April-June 2014. Study participants working at three sites located at HITEC city were interviewed using a semi-structured questionnaire that was divided into the following parts, namely (1) sociodemographic characteristics; (2) job characteristics including work type, nature, and duration; 3) psychological distress using Kessler's Psychological Distress Scale consisting 10 questions on nonspecific psychological distress and is about the level of anxiety and depressive symptoms a person may have experienced in the most recent 4-week period. The response for each of the 10 items are categorized using a Likert scale 1-5; 10 items are summed to give scores ranging between 10 and 50 to classify as low risk (score 10-15), medium risk (score 16-29), and high risk (score 30-50);  (4) health perception and the impact on well-being were measured using the Healthy Days Module Centre for disease control and prevention (CDC);  and (5) SDH grouped into nine domains-social gradient, job, housing, nutrition, water and sanitation, health-care access, life-course perspective with provident environment for self and family, community support, addiction, and stress scores were measured on a 27-item questionnaire with categorical responses or responses on a Likert scale ranging from 0 to 4. According to this scale, the lower score indicated not affected on their overall well-being but except for the scores of addiction and distress. Well-being was defined based on both a subjective evaluation of health that was obtained on a binary scale and an objective measurement of health based on past physical illness within the last month. Informed consent of the participants and Institutional ethical clearance for the study were obtained. Data analysis was done using Statistical Package for the Social Sciences (SPSS) version 17 (SPSS-Inc., Chicago, IL). The statistical measures obtained were proportions, percentages, P values, and mean scores. Binary logistic regression was performed with overall health as binary outcome and SDH as predictors. A total of 136 construction workers were included in the study. Mean age was 35.5 ± 11.94 years. Males constituted 69 (50.4%) and females constituted 67 (49.6%) of the sample. Most of the respondents had nuclear family [92 (67.6%)], followed by joint family [42 (30.9%)] and three-generation family [2 (1.5%)]. According to their marital status, 112 (82.4%) were married, 6 (4.4%) were unmarried, 16 (11.8%) were widows, and 2 (1.5%) were widowers. 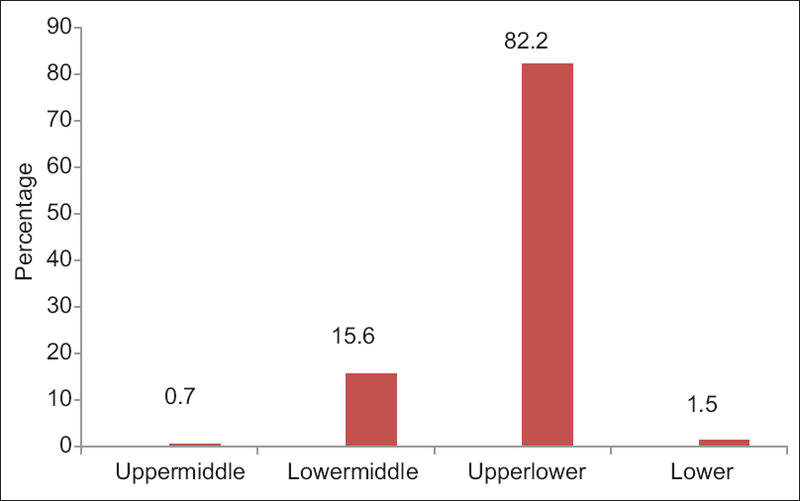 Majority of them 112 (82.2%) belonged to upper lower class and 82 (60.7%) were manual laborers as depicted in [Figure 1] and [Figure 2]. Prevalence of self-reported physical illness was found in 51 (37.47%) subjects. Among this, the most common was musculoskeletal disorders [26 (19.11%)] followed by hypertension [10 (7.35%)], pelvic inflammatory disease [6 (4.41%)] and skin infections [2 (1.47%)] [Table 1]. 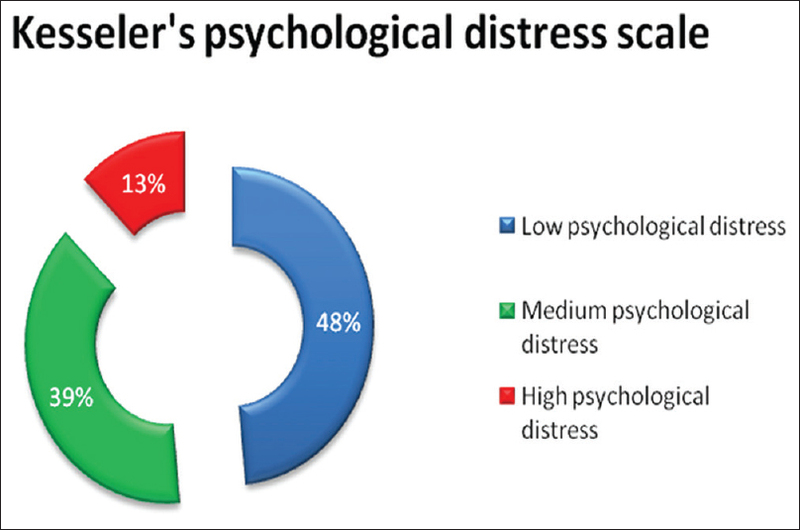 Using Kessler's Psychological Distress Scale, it was found that 17 (13%) and 53 (39%) were at high and medium risk, respectively, as depicted in [Figure 3]. The core healthy days measures assess a persons perceived sense of well-being during the past 30 days. Among the affected group, the number of days lost due to the physical illness was 3.251 ± 1.32 days, mental illness was 0.2 ± 0.146 days, and disability limitation was 0.438 ± 0.06 days [Table 2]. Mean scores of the SDH were analyzed with the binary outcome of well-being into affected and not affected groups [Table 3]. Lower social gradient score, lower employment score, and lower social and community support were found in the affected group. In these, we also found higher addiction and distress scores that were confirmed by binary logistic regression analysis. On logistic regression analysis, the significant predictors of poor well-being among the social determinants were addiction score with an odds of 2.259 and psychological distress on Kessler's Psychological Distress Scale with an odds of 1.108 [Table 4]. Construction workers are a vulnerable group with significant impairment of physical and mental health. Health is affected among these workers due to a myriad variety of factors including SDH such as addictive habits and psychological distress. These are amenable to prevention through simple ergonomic measures such as periodic examination and counseling. Physical health problems are self-reported and thus subject to measurement errors. Moreover, qualitative methods of analysis are required to identify the reasons for various components of well-being. We are grateful to Dr. K.V.S. Murthy, Professor, Community Medicine, Gandhi Medical College, Secunderabad, and all the construction workers who had participated in our study. Census of India: Economic activity. 2011. Available from: Censusindia.gov.in/Census_And_You/economic_activity.aspx. [Last accessed on 2014 Mar 7]. World Health Organization. Closing the Gap in a Generation: Health Equity through Action on the Social Determinants of Health. Report from the Commission on Social Determinants of Health. Geneva: WHO; 2008. Farrell C, McAvoy H, Wilde J; Combat Poverty Agency. Tackling Health Inequalities-An All-Ireland Approach to Social Determinants. Dublin: Combat Poverty Agency/Institute of Public Health in Ireland; 2008. p. 18. Annual report 2012-2013. Ministry of labour and employment. Government of India. pg151. Available from: http://www.labour.nic.in . [Last accessed on 2013 Dec 6]. The Kessler Psychological Distress scale (K10). Department of Health. Population Research and outcome studies. Brief Reports. Number 2002-14. Measuring Healthy Days: Population Assessment of Health-Related Quality of Life. US department of health and human services. Centre for disease control and prevention. Atlanta, Georgia: CDC; 2000. p. 8. Tiwari G, Gangopadhyay PK, Biswas S, Nayak K, Chakraborty D, Halder LC. Psychological stress of the building construction workers. Human Biology Review 2013;2:207-22. Mohopatra R. Occupational Health Hazards in Small Scale and Other Industries. 1 st ed. New Delhi: Jaypee Brothers Medical Publishers Pvt Ltd; 2002. p. 54-5. Valsangkar S, Surendranath Sai K. Impact of musculoskeletal disorders and social determinants on health in construction workers. Int J Biol Med Res 2012;3:1727- 30. Manhas S. Assessment of physical health status of female construction workers of Kathau district, J and K. International Organization of Scientific Research-Journal of Humanities and Social Sciences 2014;19:19-24. Travasso SM, Rajaraman D, Heymann SJ. A qualitative study of factors affecting mental health amongst low-income working mothers in Bangalore, India. BMC Womens Health 2014;14:22. Gaurav GD, Krushna GM, Trivedi AA. Stress among unorganized sector workers in Vadodara city. Int J Res Dev Health 2013;1:183-90.